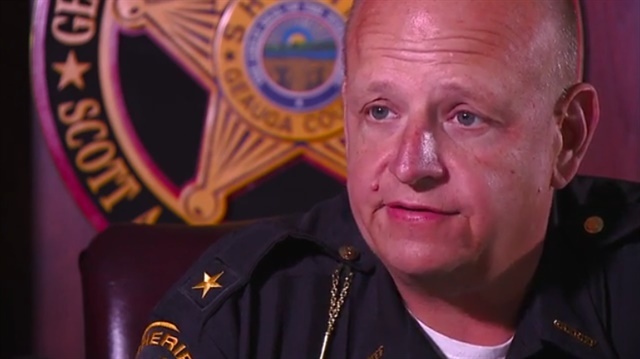 Geauga County, OH, Sheriff Scott A. Hildenbrand has prohibited any off-duty details at NFL games and is promising not to attend any games the rest of the season after this past weekend's NFL protests, reports WJW-TV. In a massive show of defiance this past weekend, more than 200 NFL players protested words spoken by President Donald Trump by choosing not to stand for the national anthem. Many coaches locked arms with the players. The protest followed a Friday rally in Huntsville, AL, where Trump said: "Wouldn't you love to see one of these NFL owners when somebody disrespects our flag to say get that son of a (expletive) off the field right now, out, he's fired, he's fired." "As far as I am concerned almost the entire league disrespected every veteran that ever fought or died for this Country. These protests are not about unity, unity was the other 70,000 fans that stood. I truly believe this is about the Police, Law Enforcement and our government. For that reason, effective immediately any off duty details at NFL Games are prohibited. "My season ticket seats will remain empty the rest of the season."